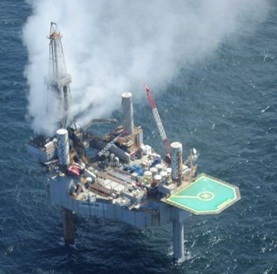 An out-of-control natural gas well off the Louisiana coast caught fire hours after 44 workers were safely evacuated from the drilling rig following a mid-morning blowout earlier yesterday [23 July]. No injuries were reported as a result of the fire according to a spokeswoman for the US Bureau of Safety and Environmental Enforcement. As of this morning it is still not clear how and when crews would attempt to extinguish the blaze although BSEE say a firefighting vessel with water and foam capabilities had been dispatched to the scene. BSEE's Angelico said Wild Well personnel had approached the well before the fire, but they determined it was unsafe to get closer when they were about 200 feet away from it. The Coast Guard kept nautical traffic out of an area within 500 meters of the site throughout the day, while the Federal Aviation Administration restricted aircraft up to 2,000 feet above the area. Chris Roberts, a member of the Jefferson Parish Council in south Louisiana, said the travel restrictions might pose an inconvenience for participants in an upcoming deep sea fishing tournament. "It could change some plans as to where some people plan to fish," he added. Walter Oil & Gas reported to the BSEE that the rig was completing a "sidetrack well" — a means of re-entering the original well bore. The purpose of the sidetrack well in this instance was not immediately clear. A spokesman for the corporation didn't have full information but industry websites say sidetrack wells are sometimes drilled to remedy a problem with the existing well bore. "It's a way to overcome an engineering problem with the original well," Ken Medlock, an energy expert at Rice University's Baker Institute said. "They're not drilled all the time, but it's not new."